Paper wasps are a half-inch to an inch long and slender, with narrow waists and pointy heads. There are more than 200 species of them, all belonging to the family Vespidae. Paper wasps chew wood fibers, mixing them with saliva to create pulp, which they use in constructing paper nests. They inhabit meadows, fields and gardens throughout North America. 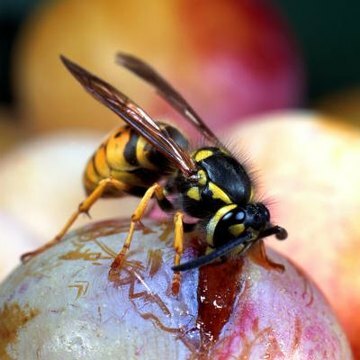 Adults eat nectar and juices from rotting fruits, and larvae are fed pre-chewed insects and caterpillars. Common paper wasps are found throughout Canada, most of the eastern and southwestern United States, Colorado, Oklahoma, Nebraska, Hawaii and Mexico. They're a dark brown color and have yellow and black banding. Their antennae are dark with orange tips. Common paper wasps (Polistes exclamans) have smoky amber wings. When flying, paper wasps can be identified by their legs, which they allow to dangle freely during flight. Northern paper wasps are also known as golden paper wasps. Their dark reddish brown color is mixed with yellow, giving them a golden appearance, and their first abdominal segment is banded in yellow. Northern paper wasps (Polistes fuscatus) are found in woodlands and savannahs from British Columbia to the Canadian maritime provinces, and south to West Virginia. Red paper wasps are reddish brown without yellow markings. Both males and females have red faces. Their first metasomal segment is narrow. Red paper wasps (Polistes annularis) inhabit the eastern United States -- Massachusetts, New York, Pennsylvania, from Ohio south to Florida, west to South Dakota, Nebraska, Kansas, Oklahoma and Texas. Southwestern Texas paper wasps are chocolate brown with yellow banding and two yellow stripes running the length of their bodies. Their faces are brown with yellow markings, and their wings are dark amber. Southwestern Texas paper wasps (Polistes apaches) are predatory wasps; they're very aggressive when disturbed. They live in Texas, New Mexico, southern California and Mexico. Polybiine paper wasps are deep black with bright yellow markings. They have a large thorax and transluscent amber wings. Known as long-waisted paper wasps, their scientific name is Mischocyttarus flavitarsus. Polybiine wasps are most active in warmer temperatures. They're seen in Nebraska, Colorado, from Idaho west to California, north to British Columbia and south to Mexico.